I’m so excited to get to share some dahlias with you this week! These are a highlight of fall blooming flowers. There should be just one dahlia stem in your bouquet, but the colors and shapes vary slightly. You might have a darker, burgundy, chocolate stem in your bouquet ( like the ones above ) or you might have a yellow, coral, or orange dahlia. You can usually determine what is a dahlia because the stem is often thicker in comparison to other flowers. (If skinnier towards the top, it sometimes gets gradually thicker towards the bottom) Another unique characteristic is that their stems are hollow. Usually in the center of the flower head can be found a tight little bud in the process of further unfolding. Part of what is so special about dahlias is that they come in so many different shapes, sizes, and colors! (which is pretty unique as flowers go) Dahlias are also more expensive per stem because unlike other annuals and perennials that die with the frost, dahlias grow from tubers that must be dug up every fall (shortly after frost), stored over the winter, and replanted in the spring. Extremely work intensive flowers! There are, however, some farmers who can get away with covering their dahlia tubers with hoops and plastic row cover to protect them over the winter and then give them a jump start in the spring, by simply removing the plastic. There are two types of crested celosia in your bouquet this week and one kind of spiked or spicata variety. As you can see, these two varieties of amaranthus look pretty different. Hopi Red Dye on the left and Love-lies-bleeding on the right. Scabiosa – Also referred to as “pincushion flower”, scabiosa is named for its traditional herbal remedy for treating scabies. For those 10-week members, you received a really lovely variety of soft yellow scabiosa in one of your first bouquets. It was one of my favorites! For those of you who recently became members and picked up for the first time two weeks ago, I’d like to direct you to the very first csa journal of the season. I did some venting/educating about the in-sustainability of the wholesale flower market and the part that you play by supporting local flower farmers! I didn’t want to straight up repeat the whole thing to all my 10-week members here, so if you have a moment, check it out. First of all, two caterpillars you may have already come across in your garden are the black swallowtail caterpillar and the monarch caterpillar. Both caterpillars eat very specific plants. 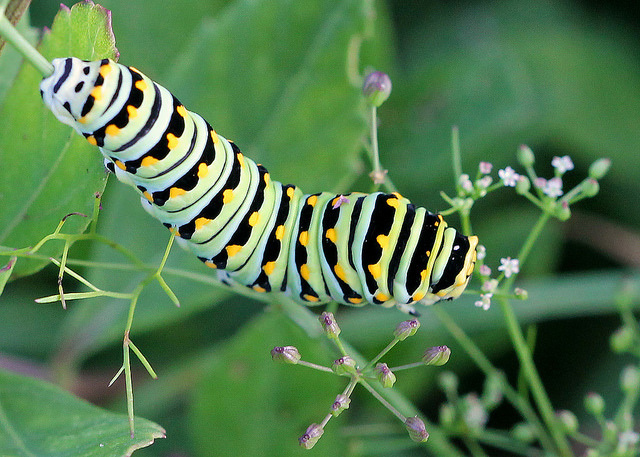 Black swallowtail caterpillars tend to be found on plants like dill, carrot tops, parsley, fennel, and wild parsnip. (but they will eat other plants too, if necessary) The leaves of all these plants have similarly-shaped leaves. 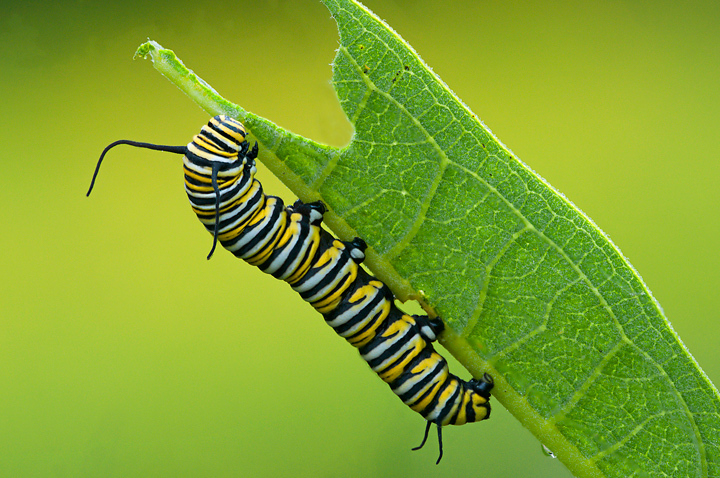 Monarch caterpillars eat ONLY milkweed plants (aka asclepias). This is one of the main reasons why monarch populations are decreasing in number. Their wild-growing host plants (milkweed) get wiped out in farm fields with the mass spraying of insecticides and herbicides. There are certainly other possible reasons for their decline, but this is one of them. I’ve had the pleasure of witnessing both caterpillars evolve into chrysalis’ and on to the butterfly stage. It’s magical to watch it all happen. I highly recommend it. Here are some photos of a monarch caterpillar I reared from its larval stage through to its adult stage. So good. Prettiest little gold detail on the chrysalis… About 6-12 hours before the butterfly emerges, the entire chrysalis begins turning translucent and you can start to make out the monarch wing pattern. Fully emerged! Also, there’s a way to tell during its chrysalis form, if the butterfly will be a male or female. This one is a female! Another special caterpillar that is very common, but not as recognized as the big, fat, juicy swallowtail or monarch caterpillar, is the camouflaged looper!! I guess I’m so excited about this one because it’s very small and hard to spot, so it’s satisfying to actually see one. Also because it feasts on flowers primarily. 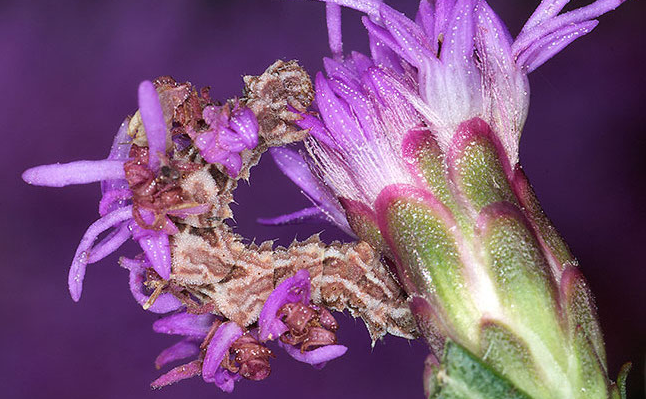 What is so unique about this caterpillar is that it not only eats flowers, but it cuts parts of the flower up and attaches them to its back, adorning the colors of its flower host plant. This photo isn’t the best example of one because it doesn’t have the zinnia on its back. The zinnia was in a bouquet of other dying flowers, including a dried-up purple scabiosa, which it seems to have taken and put on its back. Here is a better internet version of one that is sitting on the host plant it’s attached to its back. Maybe you’re not a lepidoptera nerd like me, but caterpillars, butterflies and moths are an extremely important part of our ecosystem. As caterpillars they provide a main food source for songbirds. 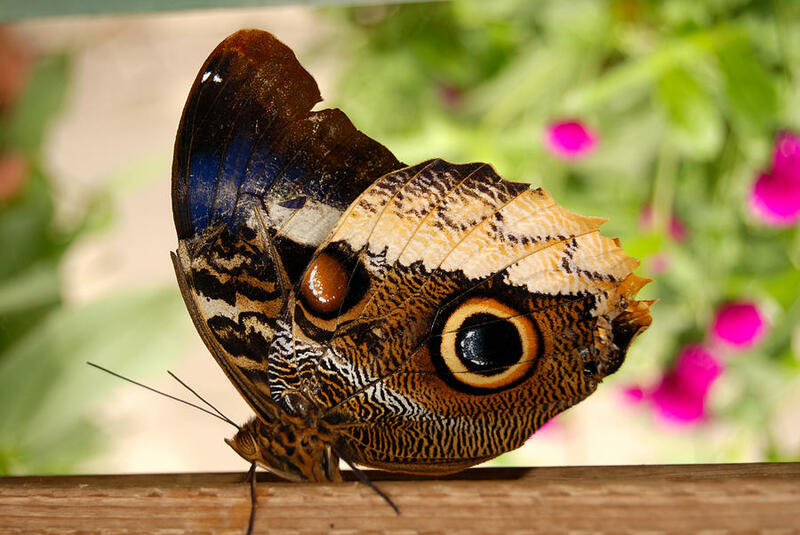 As butterflies and moths they provide pollination for ornamental and food plants. Without them, our ecosystem would not function as a whole. It’s just a secondary benefit to behold their entire transformation from caterpillar to chrysalis/cocoon to butterfly/moth, as a completely illogical, mysterious and satisfyingly strange process. So I hope you enjoy your flowers this week and keep an eye out for the beautifully-adorned camouflaged looper. This one’s an owl eye caterpillar. It turns into this.